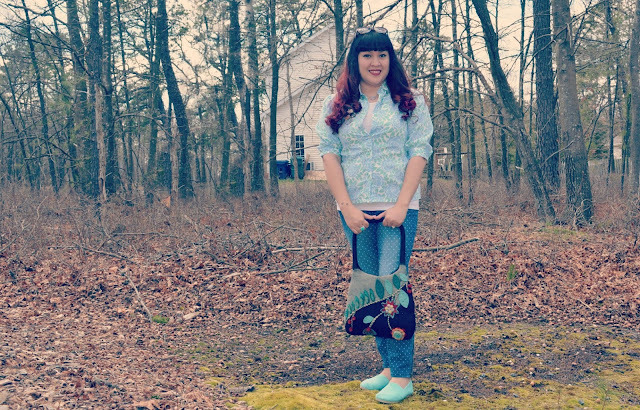 Eeka Cupcake: Outfit Diary & New Hair! There are quite a few things that I'm excited about here! One thing is my hair! I decided to finish up working on my ombre. A while back I lightened the bottom half of my hair. Over the weekend I dyed the top half black which goes into a pinkish red ombre. I'm so in love with it! I get a lot of compliments too. Out of all the different things I've done I feel like this color style suits me and my lifestyle. It's just enough fun color to keep me happy. I can wear it at work and my kids like it too, which is a plus! Second, I won a giveaway! Over at Blue Eyed Night Owl there was This Giveaway and I won! I was sooooo excited when I found out. The brooch is so cute! In the pictures my crazy mane is hiding it, but I'm glad I got a close up shot. I love owls! Lastly, I'm excited about that super cute purse! One of my very good friends gave it to me! She is a thrifting enthusiast and collects some of the cutest things. Her house is amazing! When I was over one night, she gave me this purse. She felt I would get more use out of it and I do! I love accidental gifts...those are the best! Speaking of gifts, my most favorite are the ones from kids, especially when they make them for me. The necklace I'm wearing is from my daughter. She found a necklace chain and washer. She painted the washer two different colors and surprised me with with it! My daughter also took all these pictures! She is so awesome :) We also have matching shoes! Anywhoo, I really happy that the weather here on the Jersey Shore is warming up! How is the weather where you are?